Because at times we encounter couches (and people) we can't resist. In April 2014, a Louisville, KY woman became a kidney recipient thanks to the generosity of a stranger she met on a DISCARDED couch. Read the story here. 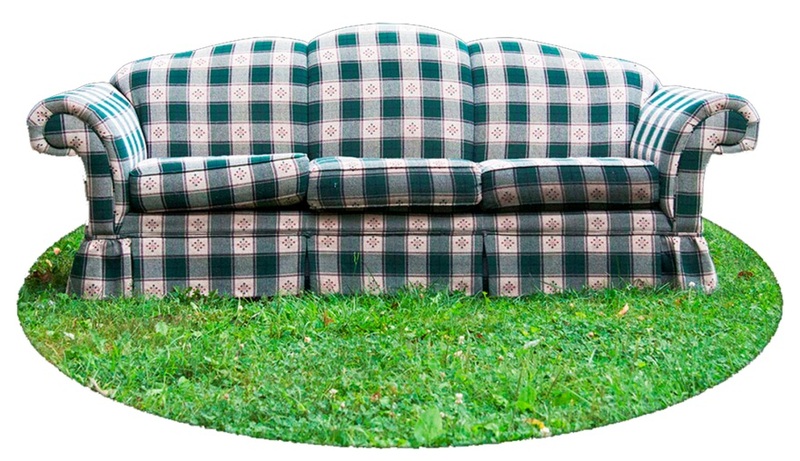 This story begins with a request and ends on a green plaid couch. First, the request: It came from Kris Kimmel, founder of the Kentucky Science & Technology Corporation and of IdeaFestival (IF), a week-long event that unabashedly advocates creativity and innovation. Because he knew of our social-practice art projects, Kris asked us to create an interactive artwork for IF participants, an artwork that might have something to do with civic health, a theme at the core of Ron Finley’s work. Ron, an urban gardener from South Central Los Angeles, was scheduled to speak at IF the day before we arrived and Kris wanted a tie-in of some kind. Because of this belief, we decided—after a series of early-morning coffees with Kris—to bring DISCARDED to IF 2013. We needed two things: an abandoned couch and strangers, people who did not know one another and would agree to sit on our couch to talk. The couch: We rescued it, glorious in green plaid, from the curb in front of a neighbor’s house. The couch appeared on the un-mowed edge of a lawn, over Labor Day weekend, under the cover of darkness. Preserved from the powerful storms (strong enough to make us wonder how often storms are lethal in cities) by the other furniture stacked on top of it, it was impossible to resist. We moved quickly to get the couch into a garage, out of the wet September morning. The strangers: We approached festival participants and asked them if they would sit with a stranger on our couch and talk with him or her for a few minutes before we returned to take their picture. After taking the picture, we would ask each person who sat on the couch to tell us a question, something that they had been pondering in either their personal or professional lives. IF would then tweet these questions and we would include them with the images in a display on the last day of the festival. Kathy and Jacqueline sat on the couch on the second day of the festival. After taking their picture, we asked them what question each of them would like us to include with their photo. Wondering how she could channel some of IF’s amazing energy into her daily life, Kathy asked this question: “What is next?” Jacqueline’s initial question was: “Will I ever find a kidney?” Almost instantly, based on what she had learned earlier that day at an IF pop-up workshop by the RISE Group, Jacqueline corrected herself and asked us to write her question a bit differently: “Would you like to donate your kidney to me?” Though Jacqueline crafted her question as one to share later with the more than 5,000 people who follow IF on Twitter, it was answered, quickly and on the spot. Kathy said “Yes.” Within 24 hours they had established that they were a blood-type match and were moving toward scheduling the surgeries. Though to some there is magic in green plaid, we realize that Kathy’s incredible offer to Jacqueline was the result of something simpler than magic. Good things happen when people talk to one another. Given a real chance, strangers often respond to each other’s needs with measurable generosity. We have experienced this kind of generosity from strangers many times on our travels from city to city, taking pictures of people sitting on abandoned couches and easy chairs. We have been offered bottled water from a fridge in the Lower Ninth Ward of New Orleans, beer and respite from the mid-summer sun in the workshop of a cabinet maker in La Brea, a working-class neighborhood in Los Angeles, and steak from a small charcoal grill propped on broken bricks in the back alley of a largely vacated street in Indianapolis. Each time, we were moved by these simple gestures coming from people we had just met.